We're so honored to be able to work with the same clients over and over again whether it's for yearly spraying for insects, landscape design, or tree work. In December a couple of our long time clients purchased a home in Danvers, MA and chose winter tree pruning to improve both the aesthetic appeal as well as the safety of their property. One of our arborists went to assess the trees for winter damage, checking for broken branches and structural damange. We worked with the client to discuss future plans for landscaping and then set out to get to work. At first glance it seemed that it would be challenging to gain access; the yard is fenced and didn't provide easy access to the trees. Once again, we were able to use our Tracked Lift to enter the rear yard through the gate with no impact to the lawn. Once in we pruned shade trees to allow for more light in the small yard and created the best environment for a garden, healthy lawn and new planting capabilities! An insect is threatening to destroy one of our most valuable native trees—the Eastern Hemlock. Hemlock Woolly Adelgid (HWA) is a tiny, aphid-like insect introduced to the U.S. from Asia. Since 1988, when it was discovered in the state, it has slowly spread throughout the region, usually by wind and birds. In addition to being small, HWA is different from other insects as it lays dormant much of the growing season and becomes active throughout the winter, producing new egg masses as early as February. HWA can be easily recognized by the presence of white cottony egg masses on Hemlock twigs. Damage is caused when the eggs hatch and the young feed by sucking sap from the twigs, killing them. Trees infested with HWA, untreated, may decline and die very quickly. Once HWA has been identified, it should be treated immediately. Effective treatments are available to manage HWA. Call now, 877/308-8733, to have your Hemlocks inspected by a certified Arborist and protected against this deadly pest. While it's true that most pruning can be done at any time of year, your pruning goals dictate when a shrub or tree should be pruned. When pruning shrubs such as Yews, Holly, Juniper, Privet, Arborvitae or Burning Bush, the best time to prune is just after the initial flush of growth. Bud break occurs on most shrubs in April or May based on temperature and rainfall. Immediately following the opening of the buds, the shrubs explode with new growth. This growing period subsides with summer heat and reduced rainfall. It's at this time, late June to early July, that pruning begins, removing the excessive growth that can cause shrubs to outgrow their intended space. Later in the summer, usually around September, a ‘touch up’ pruning is done to control the limited growth that occurs in the hot summer months. This second pruning helps maintain a neat appearance during dormant months. It should be noted that shearing of shrubs, other than hedges, is not an accepted practice by horticulturalists. The timing for pruning shrubs such as Viburnum, Honeysuckle, Forsythia, Potentilla and Weigela, is after they flower. These types of shrubs produce flower buds later in the summer for next year’s blossoms. Late June or July is the appropriate time to prune such plants to maximize the next year’s flowers. Large leaved Rhododendrons should never be sheared. Shearing damages the leaves, causing unsightly brown cut margins. Also, shearing creates a dense outer crown that does not allow light and airflow to easily reach the inside of the shrub’s crown. Shearing definitely increases insect and disease activity in all shrubs, especially Rhododendrons. 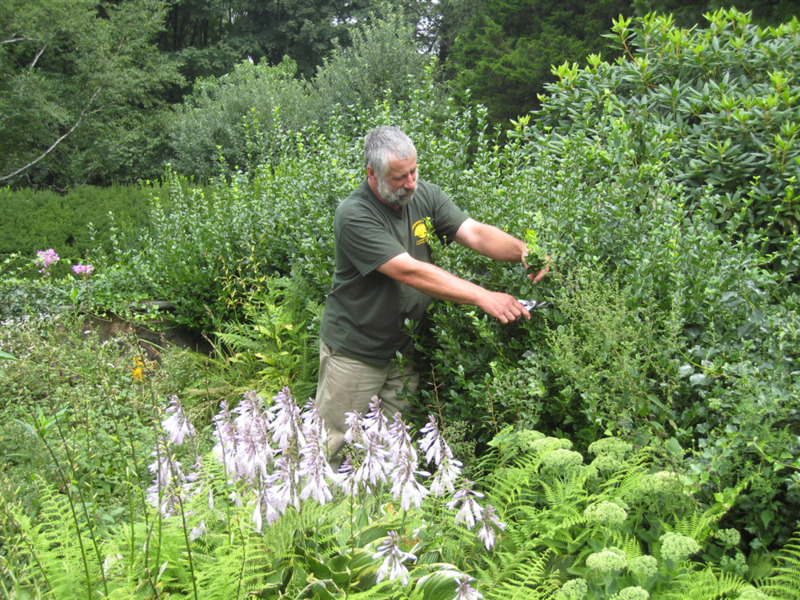 Carpenter Costin hand prunes all large leaved Rhododendrons, maintaining a natural appearance, while maintaining the size of the plant within its intended space. 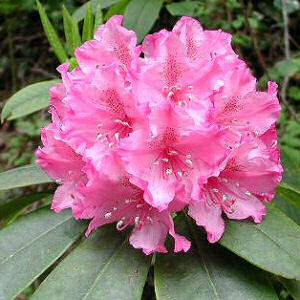 Rhododendrons are pruned shortly after flowering, which usually occurs sometime in late June. As with other flowering shrubs, pruning shortly after flowering is the best time. Shrubs such as Clethra, Spirea, Rose of Sharon, and Hydrangea flower later in the season. Summer flowers are produced on the new wood/shoots and develop in the same calendar year. Hence, pruning too early will remove flowers getting ready for this year’s display. 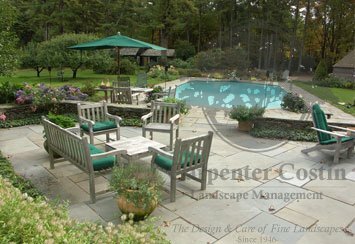 At Carpenter Costin Landscape Management we plan for 3 separate prunings each season targeting specific shrubs. The timing of our target pruning dates is completely dictated by the shrub’s development and species. (We monitor Degree Day Heating through the University of Massachusetts for a variety of purposes). As we can all see, large leaved Rhododendrons are in bloom right now. I estimate that these shrubs will be pruned at the end of June, just after their flowers fall. Spring and early summer shrubs are either flowering now or have just passed flowering. Pruning of these shrubs and the first pruning of non-flowering shrubs will occur approximately 4 weeks from now, or early July. This timing will assure that we get the most out of our spring and early summer flowering shrubs and get the best flower development for next year’s blossoms. Also, the initial growth spurt will be behind us for non-flowering shrubs, allowing for a longer period of time with a managed shape. Late summer pruning, to ‘touch up’ the almost certain additional growth of non-flowering shrubs, and the proper pruning time for summer flower shrubs, is September.